← May week 1 – Orchre Stars and friends. May Week 2 – Happy Mothers Day with bugs and buds! On Mothers Day we tend to reminisce and recall things that we learned from our mothers, grandmothers and others who mothered us. I recall how my mother once told me to “fill your heart with love.” So general and simple yet it remains dear and profound to me. This day we also recall the roots of Mothers Day. When Julia Ward Howe’s poem, the “Battle Hymn of the Republic,” was published in 1861, it brought her instant celebrity, and the song made her one of the most famous women in 19th century America. But 1870 was more important to her when she penned the original Mothers Day proclamation calling upon all women to arise and demand peace. As well today we connect with the Divine Mother and/or Mother Earth. Her compassion and life giving breath is all around us. I find it evident in her beautifully adorned body, whose abundant colors and diverse species testify to her creative energies. I, like other nature photographers, am ever challenged to create images that reveal the immensities of the earth and the pending threats to her sustainability. Hopefully when we see the intricacies of the landscape and the details of bugs and buds we are moved to do everything in our power to preserve their ecosystems. This too is a Mother’s (Earth) Day proclamation. A wide angle (8mm) lens on a full sensor camera helped me create the spherically capture of these North Beach, Point Reyes’ coastal dunes draped in ice plant. 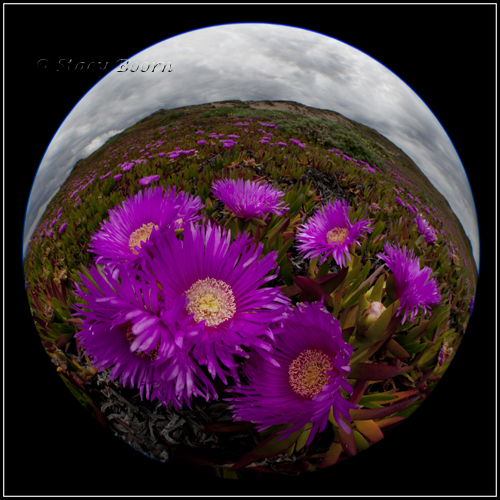 Although a non-native, the ice plant has found its home on the California coast for quite some time. In order to get the pink bloom this size in the image I had my lens a mere half-inch away from its petals. (I chose f/22 to guarantee the hyperfocal distance would include focus in the clouds). After spending time with wide-angle views it is fun to look closely at the details within the same scene. 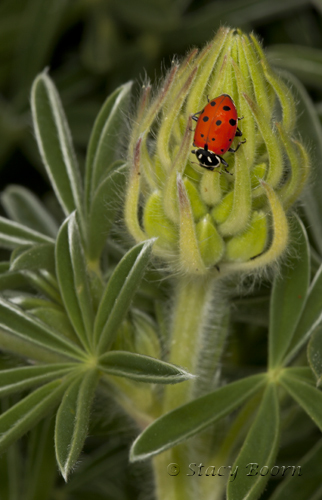 Using a 100 mm macro lens I was able to include a lady bug on a yellow lupine bud. The lady bug is yet another influential mother in our lives! Happy Mothers Day! This entry was posted in Weekly 2 and tagged Ice Plants, Lady Bug, Mothers Day, Pt. Reyes. Bookmark the permalink.